A Mw 7 earthquake occurred on December 6, 1999 at 2:12 pm AKST in the Kodiak Island region of Alaska. The earthquake was located at 57.51N and 154.67W at 45.8 km depth. Aftershocks of Ml 5.4 and Ml 6.4 followed the main shock by ten minutes and one hour, respectively. 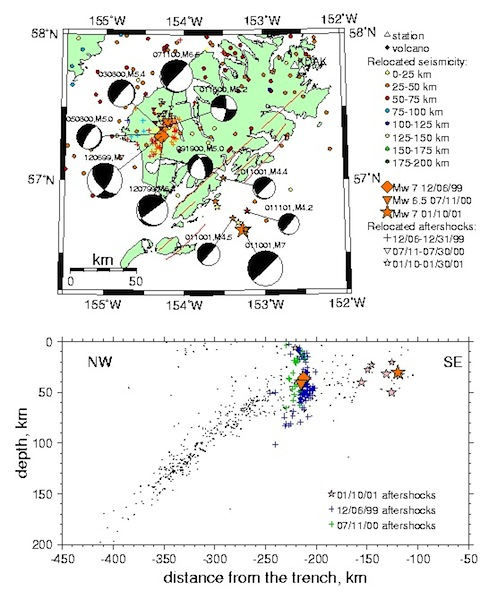 It appears that the main shock triggered a swarm of earthquakes in the Katmai volcano field that subsided in a few hours (Power et al., 2000). On July 11, 2000, a Mw 6.5 earthquake occurred in the aftershock zone of the Mw 7 earthquake. We located the earthquake at 57.36N and 154.21W at 43.6 km depth. Thirty aftershocks have been recorded in the first five days after the earthquake including a Ml 5.5 event on July 11th. In addition, there were three magnitude 5.0-5.2 earthquakes within the aftershock zone of the December, 1999 Mw 7 earthquake that occurred between January and May, 2000. On January 10, 2001 another strong earthquake (Mw=6.9, CMT) occurred in the Kodiak Island region. It was located offshore at 56.69N and 153.15W at 30 km depth (AEIC location). The 12/6/99 earthquake was felt strongly in the towns of Kodiak and Old Harbor as well as surrounding communities. It caused some minor damage including power and phone outages in Kodiak. Felt reports were received from as far as Fairbanks, 900 km away. The aftershock relocation and moment tensor inversion results indicate that both the 1999 and 2001 Kodiak Island Mw 7 earthquakes were located within the subducting Pacific plate. The former is down-dip of the locked portion of the megathrust and the latter one beneath the locked zone (Savage et al., 1999). The fault planes are parallel to the strike direction and cut across the plate through its significant portion. These earthquakes are the first well documented large intraplate events in the Alaska-Aleutian subduction zone. Tensional mechanism of the 1999 Kodiak Island earthquake and its location close to the down-dip end of the rupture zone of the 1964 earthquake (Christensen and Beck, 1994) is consistent with the slab-pull concentrating stress at the edge of a coupled interplate contact. The 1999 Mw=7, 2000 Mw=6.5, and 2001 Mw=6.9 events and their aftershocks recorded by the regional seismic network were relocated using the Joint Hypocenter Determination (JHD) method. Regional broadband data were used to calculate moment tensors for the main shocks and their larger aftershocks. The relocated hypocenter of the 1999 Mw 7 earthquake is positioned at 57.32N and 154.29W at 36.1 km depth (see figure below). The majority of the relocated aftershocks are distributed between 27 and 85 km depth along a steeply dipping plane with a SW-NE orientation. The moment tensor inversion for the main shock results indicate a fault plane trending at 29o azimuth and dipping at 67o. The moment tensor inversion for the Mw 6.4 aftershock shows a nearly pure dip-slip mechanism with the fault plane striking at 233o azimuth. The JHD location of the July, 2000 Mw 6.5 earthquake is 41.6 km deep and positioned at the northern end of the December aftershock zone (namely, at 57.41N and 154.21W). All of its 25 relocated aftershocks are concentrated to the north of the main shock location and the December aftershock sequence. The aftershocks in the subducting plate are located between 29 and 65 km depth and delineate a roughly SSW-NNE striking surface. The regional moment tensor solution indicates the fault plane striking at 223o and dipping at 89o. The JHD location for the 2001 Mw 6.9 event is at 56.66N and 153.27W at 30 km depth. The relocated aftershocsks are distributed between 20 and 50 km depth. Regional moment tensor solution for the main shock is consistent with the Harvard CMT solution which has one focal plane striking at 58o and dipping at 84o and another plane striking at 227o and dippping at 6o. Regional moment tensor solutions for the three Ml 4+ aftershocks have similar solutions with nearly vertical focal plane oriented in a SW-NE direction and the shallow dipping focal plane with a SE-NW orientation.